The Mercury Thirteen was a group of thirteen women who passed the physical tests given to candidate astronauts for the Mercury Project, in some cases surpassing the performance of the Mercury Seven, but who were debarred from serving as astronauts. 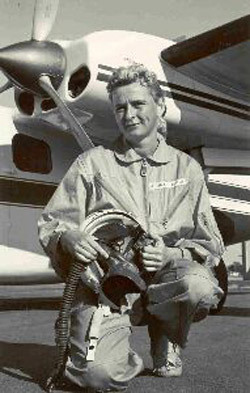 The group came about because aerospace physician Randolph Lovelace II, responsible for the selection of the Mercury Seven was curious to know whether female pilots could measure up to the same rigorous tests that the men had taken at his clinic in Albuquerque, New Mexico. Lovelace invited 26 women pilots to take the initial round of exams. The 13 who passed were Jerrie Cobb, Myrtle "K" Cagle, twin sisters Jan and Marion Dietrich, Wally Funk, Jane Hart, Jean Hixson, Gene Nora Jessen, Irene Leverton, Sarah Gorelick Ratley, Bernice "B" Steadman, Jerri Sloan Truhill, and Rhea Allison Woltman, with Funk and Cobb being outstanding. Whereas the male candidates were only tested in a sensory deprivation tank for three hours, Funk floated for more than 10. She also endured a 5g centrifuge ride even though regulations prevented her from borrowing a regulation anti-g suit: she simply wore a full-length "merry widow" girdle borrowed from her mother instead. Lovelace concluded that Funk and Cobb, in particular, "would have made excellent astronauts," but their further testing and potential selection was stymied by bureaucracy and sexism. Cobb and Jane Hart lobbied for support and, thanks in part to Hart's husband, Senator Philip Hart of Michigan, a congressional hearing on official astronaut qualifications was set for July 1962. Cobb and Hart argued their own case whereas NASA presented its views through agency administrators and astronauts Scott Carpenter and John Glenn. Cobb began by saying. "We seek only a place in our nation's space future without discrimination." However, discrimination was evident from the outset when committee chairman, Republican Victor Anfuso of New York replied in his opening remarks: "Miss Cobb, that was an excellent statement. I think that we can safely say at this time that the whole purpose of space exploration is to someday colonize these other planets, and I don't see how we can do that without women." Glenn did not help by arguing "that women are not in this field is a fact of our social order" and that women would need to be superior to be considered for astronaut selection: "If we could find any women that demonstrated they have better qualifications than men, we would welcome them with open arms." On Day 3 the hearings were canceled and Congress ruled that future astronauts must come from the ranks of military jet test pilots. Since no women were allowed to train as test pilots until a decade later, the policy effectively slammed the door on the spaceflight ambitions of the Mercury 13. However, the group was not forgotten. When, in July 1999, Eileen Collins became the first woman to command a Space Shuttle mission, she made sure that the Mercury 13 were included on the guest list for her launch.